Merlee is a character in the Paper Mario series. She is a fortune teller who speaks exclusively in rhyme in every appearance, and, for a price, she will perform a spell with her various magical devices that will randomly increase Mario's attack or defense, number of Star Points earned, or number of coins dropped when he wins a battle. 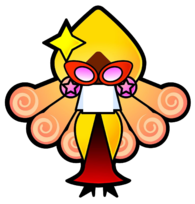 In the game Paper Mario, she is depicted as Merluvlee's twin sister and therefore also a sibling of Merlow (the latter being confirmed when Merlow receives a letter from their father). She resides in a hidden alley in Dry Dry Outpost and uses cards to power Mario up. Merlee offers three payment plans, and the length of time for which Merlee's spells last is dependent upon which plan Mario picks (e.g. the most expensive plan lasts the longest). Merlee's spells take effect randomly during or after battles, and the effects they bestow upon Mario are also random. When activated, a spell will either increase the amount of coins Mario receives after a battle, double his Star Points, or increase his attack/defense power by 3. Each of these effects lasts only as long as a given battle. After a period of time, Merlee's spells wear off, forcing Mario to pay Merlee if he wants their effects again. After delivering a letter from Merlee to Merlon with Parakarry, Merlon says, "Oh, my granddaughter, Merlee! She recently entered the family business...". In Paper Mario: The Thousand-Year Door, she can be found in Rogueport Sewers. Merlee performs the same service in this game as she did in Paper Mario (and is even given the same depiction as Merluvlee's twin, according to Goombella), except she uses a magical box instead of magical cards to enhance Mario's luck. During the events of Paper Mario: The Thousand-Year Door, Merlee submits a trouble to the Trouble Center in Rogueport, where she requests to be reminded of the ingredients for a Heartful Cake. Toce T. in Petalburg informs Mario that the recipe for the cake requires Ruin Powder mixed with Cake Mix. Toce T. questions who Merlee might be making a cake for this time. Once Mario has a Heartful Cake in his inventory and returns to Merlee, he is rewarded with 30 coins. Merlee returns in Super Paper Mario. In this game, she lives in a mansion at Gloam Valley. She later moves to Flopside in a building adjacent to Merluvlee's house in Flipside to help Mario and his party, where her theme song, "The Road for the Lost" (which is also Merluvlee's theme), can be heard. In this game, Merlee appears rather angular and strange unlike in previous installments, taking on the appearance of other female members of Merlon's clan. According to the InterNed her theme heard when Mario and Peach talk to her in her mansion via magical projection is titled "Look out for me". Merlee's Mansion is a major level in Chapter Two. Mimi also makes an appearance here, initially posing as Merlee's maid in her standard form, then eventually Merlee herself – in three separate occasions, in fact. The first is when she attempts to trick Mario into thinking he finally found Merlee, but an apparition of the real Merlee appears, exposing her as a fake. She impersonates Merlee again once the real Merlee is found hiding in a washroom stall, causing a confusion that is only settled with a game show hosted by The InterNed (although the real Merlee had a fly buzzing around her head due to hiding in the toilet, providing an easier way to tell her apart from Mimi). During the subsequent battle with Mimi, Merlee cheers from outside the bathroom, healing Mario and his party. After Mimi is defeated, Merlee gives Mario and his party the third Pure Heart. Much later in the game, Mimi disguises herself as Merlee once more in Castle Bleck, asking Mario and friends what monsters they fear the most. In this game, Merlee is Merluvlee's rival, and has been ever since they were classmates. After Chapter 3, Merlee works as a fortune teller in Flopside. She begins a trading sequence by requesting that Mario bring her a Crystal Ball from Merluvlee. Merlee also apparently once helped Merluvlee greatly sometime before the events of Super Paper Mario, as Merluvlee tells Mario and friends to tell Merlee "Now we're even" as they give her the Crystal Ball. In the end, Merlee gives Mario and co. a key that unlocks the building holding Piccolo. Merlee's charms work differently in this game than the previous games. For her cheapest spell, she'll make Mario and friends get a helpful item every time they defeat 25 enemies for 10 times. For the medium priced, she'll give Mario and co. a helpful item every time they defeat 20 enemies for 15 times. And for the most expensive, she'll give Mario and co. a helpful item every time they defeat 15 enemies for 20 times. She is very useful for the Pit of 100 trials. She will, however, allow the player to receive any level of charm for free just once if Mario and friends brought her the Crystal Ball from Merluvlee. The length and frequency of the charm will depend on which charm is chosen. Trial Package: The Roulette will appear every 25 enemies defeated and lasts 10 times. Advised Package: The Roulette will appear every 20 enemies defeated and lasts 15 times. Special Package: The Roulette will appear every 15 enemies defeated and lasts 20 times. Merlee makes an appearance in volume 37 of the Super Mario-Kun, where she is captured by Mimi. Mimi then disguises as Merlee and leads Mario into the trap. When Mario defeats Mimi and rescues Merlee, Merlee gives Mario a Pure Heart. Card Description: This charmer uses the sun to work her magic. She is a descendant of the Tribe of Ancients. These facts are about Merlee, she reveals them during the "That's My Merlee!" Show in Super Paper Mario. Merlee was born on March 25. Her favorite smell is fresh air. Her favorite food is strawberries. She washes her bangs first in the shower. Her nickname is the "Bashful Ghost". She has no preferred type of guy. Her favorite animal is a bear cub. Her hobbies include looking through catalogs for Crystal Balls. Her best feature is the lobes of her ears. That's the charmer, Merlee. She's bright and cheery, huh? If you have her charm you, you'll receive various bonuses in battle. They're super-helpful, so next time you have a chance, be sure to have her charm you! Oh, AND I hear she's the twin sister of Merluvlee, the fortune-teller! This page was last edited on March 17, 2019, at 03:17.